Warning: This is a sad story and WILL break your heart. I, however, still encourage you to read it in respect of the dog in the story, Hei Bao, and many stray and rescued dogs like him in China. His name is Hei Bao. He was abandoned and later rescued by our partner shelter, TAAC, in Beijing when he was just about 3 months old in 2008. After living in the shelter for 2 months, he was adopted by an old lady from a rural area just outside of Beijing. Our volunteers referred to her as Old Mama. Hei Bao was a very lucky boy as Old Mama loved him and took very good care of him. Hei Bao loved to carry things and move them around when he was a puppy. He moved inside things outside and outside things inside, over and over again. Old Mama nicknamed him “The Mover”. Time flew by, Hei Bao lived very happily with Old Mama for 4 years until Old Mama was diagnosed with late stage breast cancer. Hei Bao went back to the shelter as Old Mama was no longer able to take care of him. After moving back to the shelter, Hei Bao became very depressed. He was not active and avoided almost all contact with people or other dogs in the shelter. He always just stayed in a corner alone and cried. At one point, he decided to stay in a very tight corner in the kitchen for a very long time. He refused to eat, drink or come out. When the shelter volunteers tried to get him out, he just screamed and cried as soon as they touched him. The volunteers knew that Hei Bao was missing his old home and Old Mama. At that point, Old Mama was in the hospital, and she was not doing very well. After our shelter volunteer told Old Mama about how Hei Bao was doing in the shelter, she asked to see Hei Bao again. Our shelter volunteers took Hei Bao to the hospital, and they waited around the hospital until finally they caught a chance to sneak in with Hei Bao. Just as everyone predicted, both Hei Bao and Old Mama were extremely happy to see each other. Old Mama decided to move back home with Hei Bao, in spite of her health problems. She wanted to be there for Hei Bao, as well as with him for the little time she had left in this world. She knew both her and Hei Bao would be happier that way. About two weeks after the reunion, Old Mama passed away. Hei Bao continued to stayed at Old Mama’s home with her husband. That was the place where he felt home and shared his entire life with Old Mama. 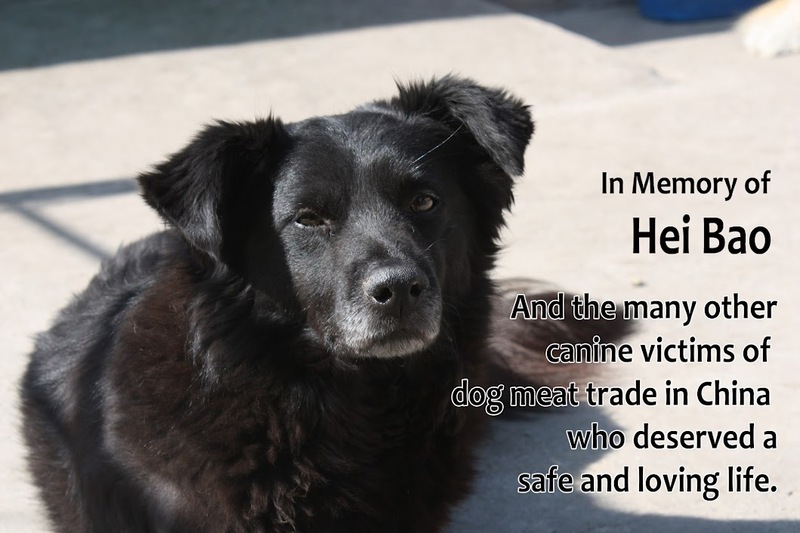 Just a few days ago, Hei Bao was stolen by dog meat smugglers. Everyone’s heart was broken when we heard the news, yet nothing could be done. Once upon a time, Hei Bao was one of the lucky strays rescued by volunteers and adopted into a loving home. 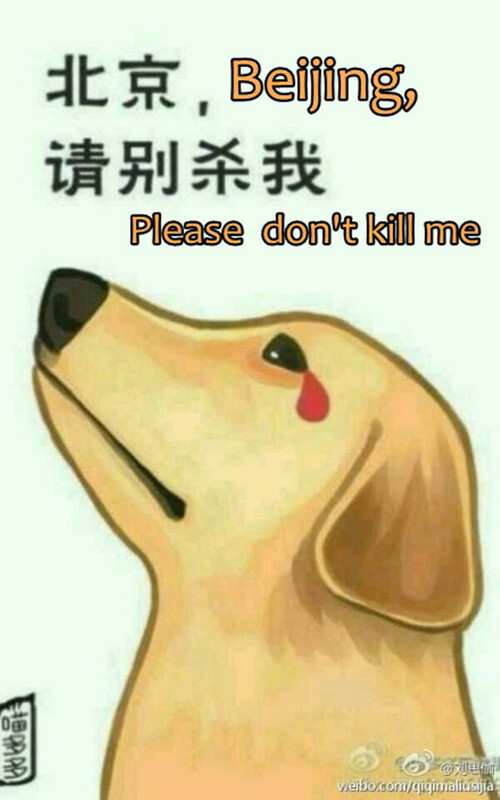 How much more does it take for the dogs to be safe in China? Even a second chance was clearly not enough for Hei Bao. There are millions of dogs that don’t ever get a second chance. They have never known what it feels like to be petted, hugged, and kissed. In China, Hei Bao is still one of the lucky ones. At least, he was once loved.